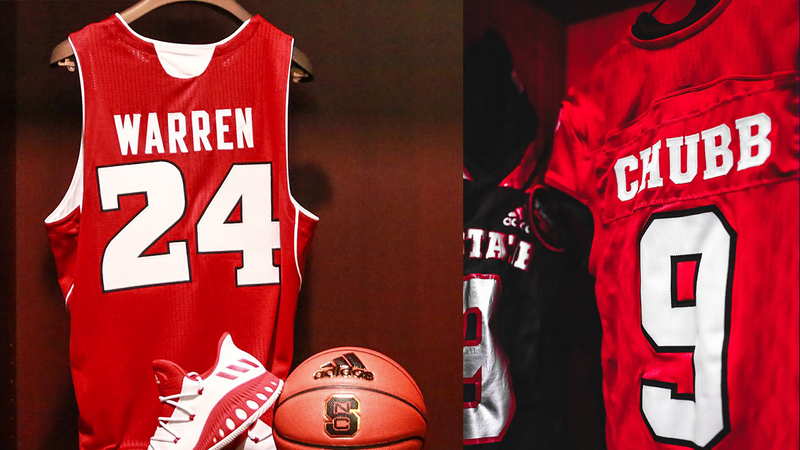 RALEIGH, NC (WTVD) -- Two of the best to wear Wolfpack red and white will have a commemorative jersey on display at the venues they starred in. Bradley Chubb, the fifth overall pick in the 2018 NFL draft will have his No. 9 hanging at Carter-Finley Stadium. Chubb, the 2017 ACC Defensive Player of the Year, set school records for sacks and tackles for loss. In addition, football coach Dave Doeren will designate a #9 patch to a "standout" player. Along with Chubb, Mario Williams also wore No. 9 and was the first pick in the 2006 NFL draft. "I am very humbled by this honor and wish I could share it with my Wolfpack teammates," said Chubb. "NC State will always be a very special place for me and having my name up in Carter-Finley Stadium is a dream come true. I was very proud to wear No 9 because of Mario Williams and hope that future players wearing it will be proud to represent me as well." Basketball star T.J. Warren only spent two years at N.C. State, but left a major impact with his 24.9 points per game. Warren, who wore No. 24, will have his jersey hanging among other elites at PNC Arena. A Durham native, Warren is with the Phoenix Suns. "I'm very proud to be honored along with all the other former great players in Wolfpack history," said Warren. "NC State is a very special place." Ceremony dates and times are yet to be determined.